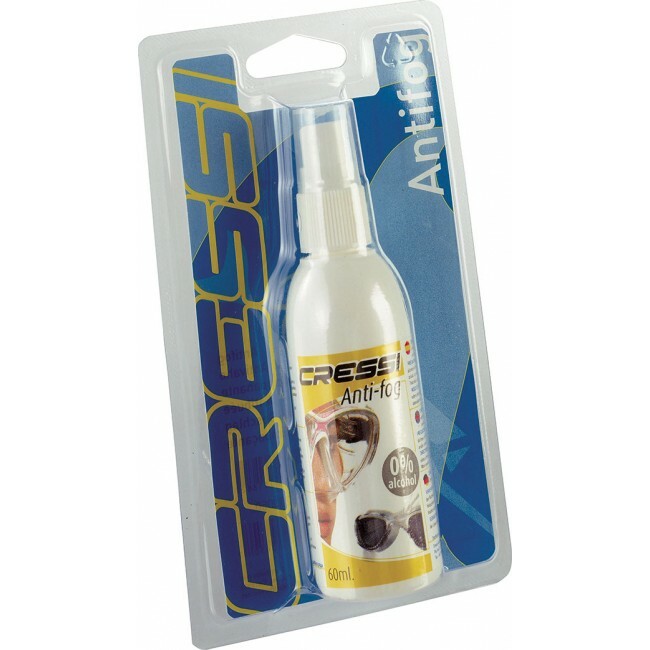 Cressi Anti-Fog 0% Alcohol 60ml this product has been specifically designed as an anti-fog protector for diving and swimming goggles, although it is equally effective on any vitreous surface (inside of windshields, bathroom mirrors, vision glasses, etc...). Given its neutral pH (7.0) and the zero irritability of its components, it is ideal for use on surfaces near the eyes. Its base is only deionized water and does not contain any type of organic solvent (isopropyl alcohol, ethyl, glycols, etc.) since under immersion conditions, they could evaporate and affect the surfaces and eye fluids. Applied correctly (according to instructions of use) creates a protective film that prevents the condensation of microdrops on the surface where it has been used. Its low concentration in surfactants, along with the silicone it incorporates, extends its effectiveness for about 2 hours (depending on conditions). As formulated, it is the ideal combination of effectiveness and safety of use, for swimming and diving activity.